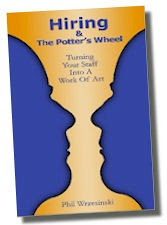 Phil's Forum for Independent Retailer Success: Excerpt From the Book "Hiring and the Potter's Wheel"
Excerpt From the Book "Hiring and the Potter's Wheel"
Here is an excerpt from my new book, "Hiring and the Potter's Wheel: Turning Your Staff Into a Work of Art"
Mary laughed at the memory, thinking at the time that this was one card she’d be glad to toss. But she found a pocket beneath her graduation gown and tucked it away. When she bought her first Rolodex, somehow his card found its way in. Now she looked at the card. Should she call? Mary feared that all he would say was, “You can do better,” and she had no response. Doubts and fears battled across her mind. She was muddled on what to do. Mary glanced at the memo staring back at her. Twenty great sales reps in three months. She had to find them, hire them, and train them with no room for error. Mary picked up the phone and dialed. “He’s probably not even there,” she thought. Would you like an easy-to-follow method that takes your hiring and training to a new level? The book is an enjoyable read and will produce results for you immediately. I just read the book last night, cover to cover--I loved it! As a store owner, I thought the information was invaluable. I struggle with the correct steps to take in hiring and training new staff. The steps laid out in this book are so easy to follow...common sense really. The story was one that you didn't want to put ...down. Following the process of someone learning pottery, was a beautiful way of describing just how we are to create a "work of art" staff. Thanks Phil! I just received Phil's book yesterday. If you didn't purchase it at market you should order it. It is a easy read and worth the money if you struggle with hiring good employees. Phil, great job on the book, I started it this morning and didn't want to put it down. Buy it today right here. Happy hiring!